WITH ALL THE NEW ADVANCED TECHNOLOGY AND INNOVATION, THE CAREERS IN THIS INDUSTRY ARE QUITE GOOD AND THE JOBS ARE WELL PAID, DYNAMIC AND INTERESTING. WE NEED TO BE PROMOTING THE INDUSTRY BETTER, ESPECIALLY TO YOUNG PEOPLE AND TO WOMEN. With 25 pieces of equipment and 80 employees, Fennell Forestry is one of the largest logging contractors in South Australia. Siblings, Wendy and Barry Fennell purchased Fennell Forestry from their parents five years ago. As CEO, Wendy Fennell manages the day-to-day operations and brother Barry works on new business development. Like many young people, Wendy didn’t know what she wanted to do for a career when she was deciding on a university program. “I like money so I went into accounting and thought I would see where that went,” she says. At the age of seventeen, just before going to university, she worked alongside her father, travelling to job sites and helping him in the workshop. The following year Wendy went to the University of South Australia to study accounting but arranged her days so she only had lectures on Monday and Wednesday, allowing her to drive back home to work in the family business. Wendy had one more year of university left when the family business won its biggest contract. “I was two years into my three-year degree and I decided to do the last year by correspondence and come back to work. And I’ve been here ever since,” she states. Fennell Forestry has an impressive depot with a professional office, spacious workshop, an area dedicated to chain sharpening, an onsite training room and parts warehouse. Wendy has been in the business for 25 years and people are still surprised when they find out what she does for a living. “I guess they don’t really understand exactly what I do and they are typically shocked at how much knowledge I have of the machinery.” She knows some female skidder operators and truck drivers in the area but does not know of any other female forestry business owners. I REALLY LOVE LEARNING ABOUT THE EQUIPMENT AND HOW WE CAN GET THE BEST OUT OF IT. THERE IS ALWAYS SOMETHING ON THE GO AND IT’S ALWAYS EVOLVING. There are definite challenges to managing a growing company. Wendy and Barry are always looking for new innovative ways to operate and grow but without sacrificing or losing what made the company successful in the first place. That is why they decided to enroll in the Business Growth Program offered by the state of South Australia. Wendy wanted to establish how to effectively grow while holding true to the company’s core values. Fennell Forestry’s transport business consists of seventeen B-Double Units and one A-Double Unit. 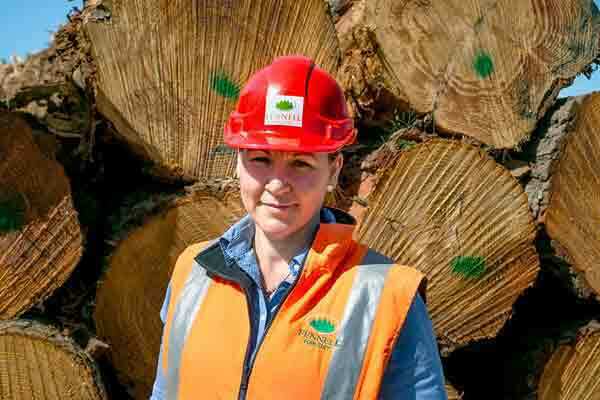 Fennell Forestry’s success story is built upon South Australia’s thriving Green Triangle timber industry. Reflecting its name, the Green Triangle is one of Australia’s major forest regions, covering an area of 6 million hectares (15 million acres). It has extensive plantation softwood and hardwood resources. The Green Triangle spans between the states of South Australia and Victoria with ready access to the capital cities of Melbourne and Adelaide. Processing activities are centred around the cities of Mount Gambier in South Australia and Portland in Victoria, which also provides the region’s port. Fennell Forestry continues to ensure it has the proper infrastructure and personnel to support the growth. The company has its own workshop, an operations manager helping support both the logging and transport side of the business, a full time operator trainer and a training room for classroom sessions, as well as a large parts warehouse with plenty of inventory. Wendy and Barry make a great team. “You can’t beat being in business with family because you know those core values are the same.” Wendy acknowledges that she and Barry are very different. “I am more structured and he’s got the random thoughts and entrepreneurialism. I like to get in and do things with structure and see things out. Whereas Barry is always moving forward, looking for the next improvement.” The balance in personalities definitely contributes to the company’s success. “I think that’s what makes it work so well,” says Wendy. On top of all Wendy’s work responsibilities, she is a single mother of two with eight-year-old, Flynn and six-year old, Hudson. Her boys really enjoy watching the equipment run but they have other career aspirations at this stage in their lives. Hudson wants to own a pet store and Flynn wants to be the next Shaun White (a professional snowboarder). Wendy enjoys family ski vacations, recently visiting Whistler, British Columbia and New Zealand. “Flynn wanted to try snowboarding, but you couldn’t snowboard until you were eight, so I had to go back when he was eight, and that’s where we went last year. The boys have been hooked on the Winter Olympics, telling me all about it when I get home from work,” she says. Wendy doesn’t mind working as hard as she does. She always makes sure she wakes up with the boys and is there to put them to bed. “It throws everything out of whack, when I have to be away at night,” she says. She keeps it structured so the boys always know when she will be home.